The University of Guyana (UG) in its efforts to re-connect with past graduates and past faculty staff, last week Wednesday, launched the Berbice campus chapter of its Alumni Association. The goal of the Alumni Association is to connect graduates and past faculty and staff of UG in a reciprocally beneficial relationship of investing, nurturing, fundraising, mentorship and development. Persons are being urged to give back to UG through scholarships, mentorship, equipment, books, internships, monetary gifts, travel bursaries and through other kind gestures. At a simple ceremony held at the university’s Berbice campus to mark the occasion, Tenth Vice Chancellor Professor Ivelaw Griffith (Class of 1980 and 1981); encouraged those gathered to give back towards the development of the country’s sole national university. This campus was established in 2002 and produced its first batch of alumni two years later. The Vice Chancellor said that an alumni community cannot be built by “simply wishing it would happen.” In this regard, he said this is where the process of institutionalization comes into play, adding that one way to do so is by creating alumni associations and chapters. Professor Griffith pointed out that the purpose of these chapters is not merely to garner funds, but to also play a vital role in helping to bring others into the university so that they could have similar or better experiences. The strength of any university has to do with its graduates, and how these past students help to strengthen the brand of the university and how they help to pave the way for others. 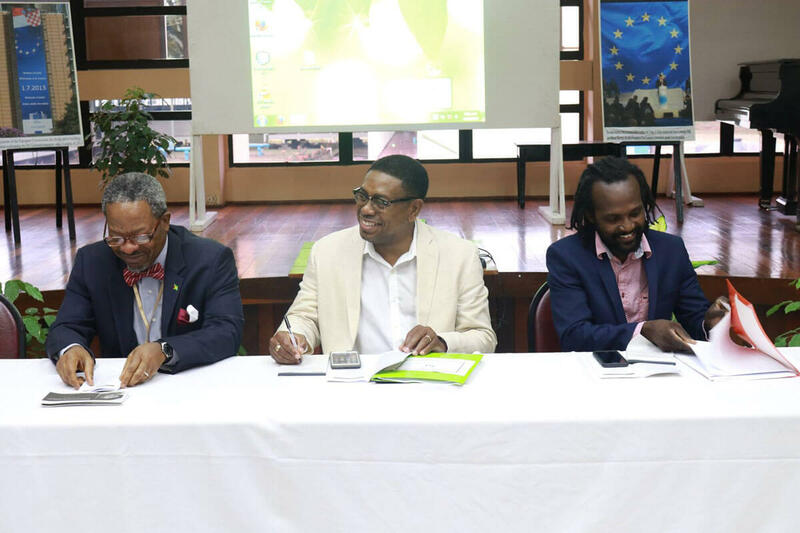 More than half of a century after it was founded, the University of Guyana on June 2, last, launched its Alumni Association under the banner Proud Legacy: Prosperous Destiny at the institution’s Turkeyen campus. Speaking at that event was Professor George Danns (Class of 1975) who noted that the establishment of an alumni association is long overdue, as he spoke of the importance of alumni in sustaining the educational charge of the university. Pointing out that the University has educated past and current presidents, cabinet ministers and the acting Chancellor and Chief Justice, Professor Danns recommended that the alumni association be registered as a not for profit voluntary organization consistent with the university statutes and the laws of Guyana. Deputy Vice Chancellor for Philanthropy, Alumni and Civic Engagement (PACE), Professor Paloma Mohammed (Class of 1992 and 2000) has since revealed that the New York and Toronto chapters will be launched later this month, while the London Chapter will be launched later in the year. 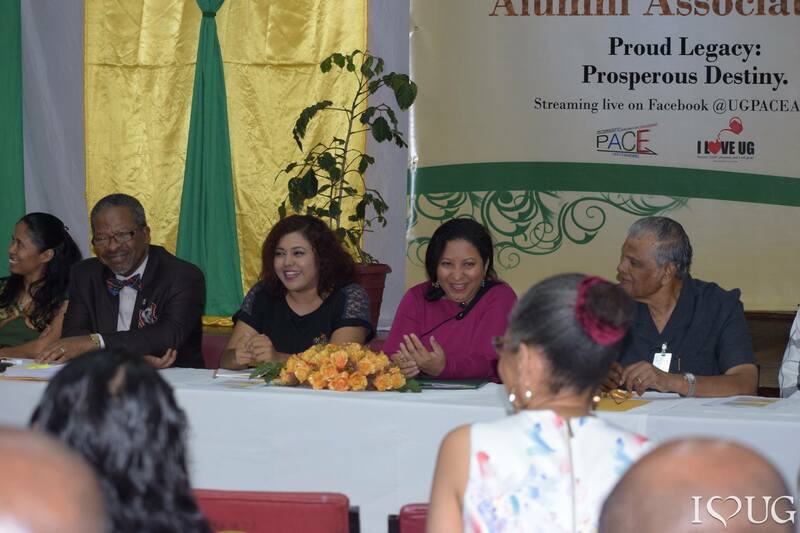 On June 1, the University of Guyana (UG) launched its alumni association under the theme Proud Legacy: Prosperous Destiny. According to Vice Chancellor Ivelaw Griffith the creation of the association which comes more than 50 years after the opening of UG is part of a renaissance journey to rebuild a university that has for a variety of reasons suffered neglect. He said that the rebuilding cannot be left to one set of stakeholders and acknowledged alumni as critical to the process. Quoting the former United States President John F. Kennedy, Griffith noted that you can tell the greatness of a university by how its products have contributed to their society before adding that UG’s greatness is not only reflected in alumni contributions to Guyana but also to the Caribbean and the world. The VC stressed that these amazing products can now help to rebuild the institution and called specifically on those who attended free of cost in the 70s and 80s to honour their obligation to help rebuild the place where they gained so much. Chancellor Nigel Harris was absent from the launch but sent a message which was read by Pro-Chancellor Joseph Singh. In the message, Harris noted that the launch will be remembered as one of the more important milestones in UG’s history and said that it is important that UG celebrate its alumni and that alumni celebrate UG. Mobilization of alumni is critical to the realization of UG’s vision of the future, he explained, adding that they can offer the university advocacy in the business community, regional and international agencies, as well as government and civil society to generate support for programmes and projects for its development. Other possible areas of contribution include mentorship, internships and personal donations. In the area of personal donations, Harris noted that donor agencies often ask universities what percentage of alumni give back, not how much they give but how many of the alumni support the institution. Working to secure the stature of UG will help alumni when asked to give assurance of the value of their degree, he concluded. Deputy Vice Chancellor Paloma Mohamed who as the head of the Office of Philanthropy, Alumni and Civic Engagement (PACE) has been at the forefront of efforts to bring the alumni association to reality explained that while UG has populated the world it was a steep, hard climb back into the hearts and trust of alumni . “It’s a tremendous job, a lot of hard work to bring people back,” she said, before acknowledging past efforts of those such as Marlene Cox who worked in Alumni relations. Mohamed explained that the Turkeyen Chapter of the association was the first of five to be launched this year. Berbice is set to be launched on June 27, New York at the end of July, Toronto on July 18 and London later in the year. Three students from the South American country of Guyana are currently pursuing master’s degrees in agricultural regulations from the University of Arkansas at Pine Bluff. In addition to regular coursework, they are fulfilling graduate assistantships through work on a UAPB project intended to increase the availability of high-quality sweet potato planting materials to limited-resource farmers both in Guyana and in the Arkansas Delta. Ryan Nedd, Tiffanna Ross and Kenisha Gordon – all alumni of the University of Guyana (UG) in Georgetown, Guyana – are being trained in plant breeding, virus-indexing and other molecular techniques at UAPB’s state-of-the-art tissue culture laboratory. 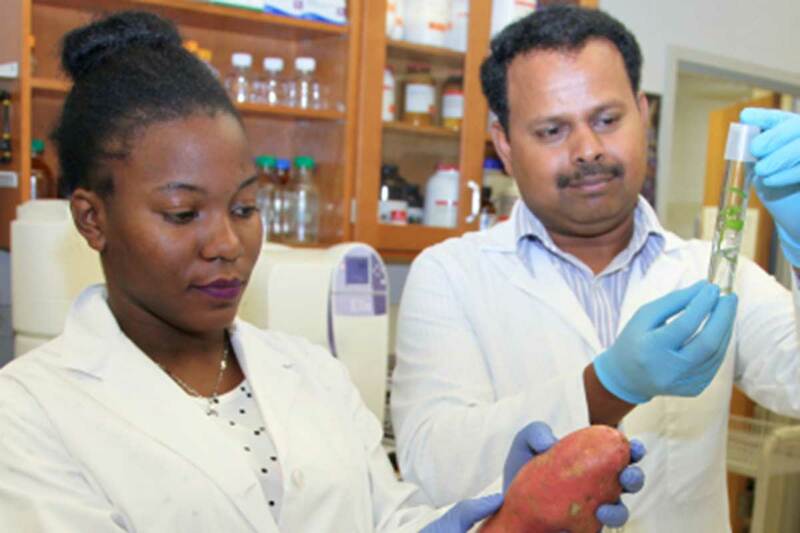 An integral part of the UAPB Sweetpotato Foundation Seed Program, the laboratory allows researchers to develop and multiply virus-indexed sweet potato slips. The experience the students gain using UAPB’s resources will aid in the development of a similar facility in Guyana in the coming years. At the tissue culture lab, the students are working to breed sweet potato plants with better resistance to common diseases and pests. After hybrid plants are tested in the field, the plant lines deemed healthiest and virus-free will be multiplied for distribution to farmers in Guyana. Ross said sweet potatoes are packed with nutrients and are an important part of food systems around the world. The increased production of sweet potatoes at local levels in the Delta and in Guyana can lead to health benefits for both populations. Nedd said continued cooperation between UAPB, UG and organizations such as the National Agricultural Research and Extension Institute in Guyana will lead to more shared research opportunities for sweet potato crop enhancement. While studying at UAPB, he appreciates the balance between field research opportunities and lessons learned in the classroom. 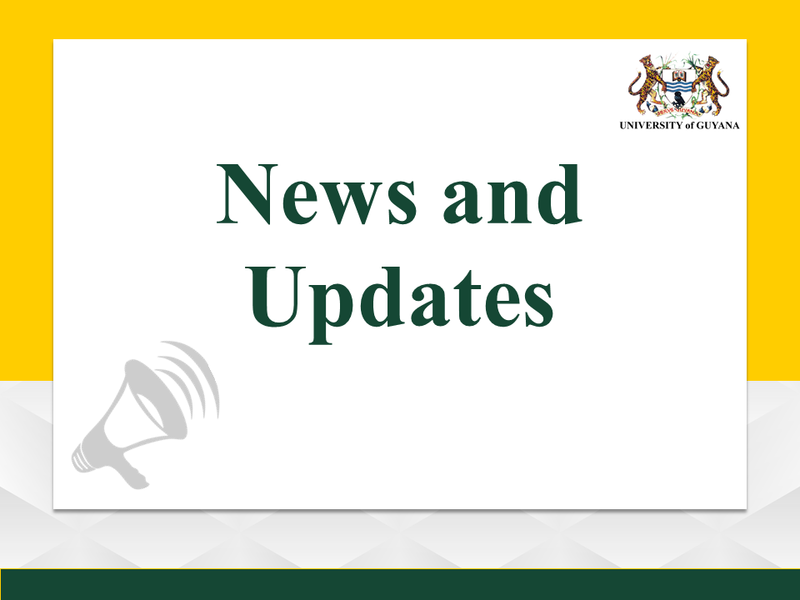 Ross said the agricultural regulations degree program is structured to give students a broad familiarity with a wide range of subjects including molecular biology, biochemistry, biotechnology, plant breeding, food safety and food microbiology. The versatile nature of the curriculum ensures students can be hired in a number of areas after graduation. To further prepare students for their future careers, the course hours and requirements are designed to emulate the expectations of a professional in the field. Gordon said she chose to pursue a master’s degree in agricultural regulations at UAPB to obtain a broad theoretical understanding and practical research experience in the area of food safety and related fields. She believes the degree will propel her toward her career goals of managing and increasing the awareness of agricultural food safety and quality assurance in Guyana. In addition to the challenging nature of the degree program, Gordon said she appreciates the campus atmosphere at UAPB and some similarities to her home in Guyana. 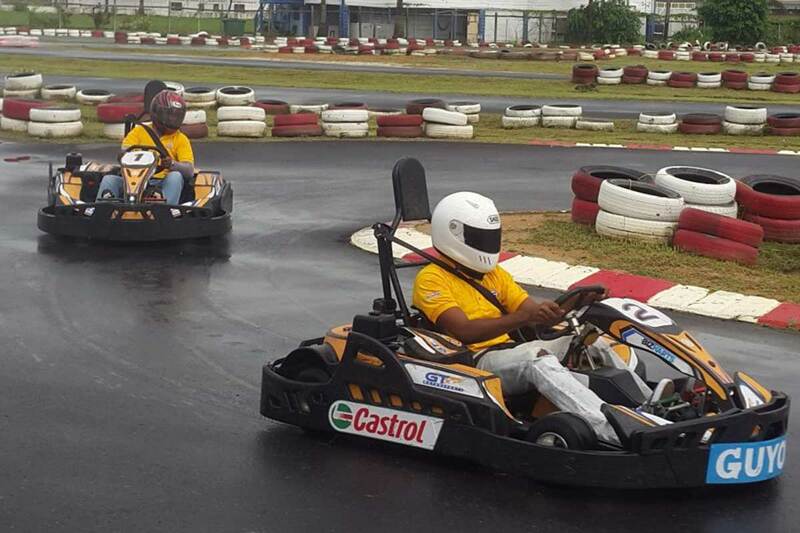 The University of Guyana’s (UG) ‘Race for Pace’ fund-raising Go-kart event on Sunday at the GT Motorsports track was a huge success with the organisers meeting their target of $4M for the Student Support Fund. It was a day of fun, thrills and spills and the rain only contributed to the excitement, as persons gathered to race for a good cause. While the race of the day featuring Vice-Chancellor of the University Dr. Ivelaw Griffith and Professor Suresh Narine had to be postponed because of time and wetness of the track, that did not stop the event from having some good races early on. The Alumni and Friends ended up being the most star-studded race with Deputy Mayor Sherod Duncan and lawyer Darren Wade finishing fifth and sixth respectively. However, Christopher Persaud won the race, while Azad Hassan finished second and Gavin Persaud third. Duncan and Wade agreed to the fact that the cause of the fund towards aiding students in need was definitely a good move by the University while commending Deputy Vice-Chancellor Dr. Paloma Mohamed for her initiative with the fund. Vice-Chancellor Dr. Griffith also highlighted that such an event is not just important because of the impact it will have on students in need, but also the impact on student/staff relationships that can only develop campus life. Meanwhile, Dr. Mohamed, the brainchild of the event, shared the importance of the University helping students in need and using sport as a means of impacting student life both on and off campus. In addition, Dr. Mohamed was enthusiastic of the event becoming an annual staple on UG’s calendar of activities. Meanwhile, other winners of the day were Rinaldo Delano in the student race, Christopher Ramakrishna in the staff race, Kezia Bridgewater in the female event, Nicoli Mahangi in the student versus staff race, Christopher Ramalho in the Turkeyen versus Tain event and Ron Glasgow in the male versus female event. UG’s Sport Coordinator Lavern Fraser-Thomas mentioned that such events highlight the impact sport can have on society and noted that more events of this nature are needed not just on campus but holistically to help athletes in general. The top race of the day, which was postponed, will be held at a later date. “LIVE YOUR dream. Be as crazy as you possibly can be, ignore the status quo, set your goals and go after them with blind determination,” Social Entrepreneur, Eldon Marks said as he addressed a room full of entrepreneurs and software developers in a collaborative work space he had developed with his business partner, Chitra Dwarka. 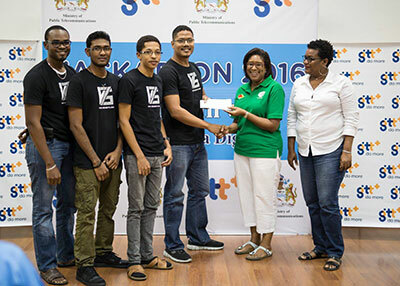 Marks, who ever so often describes himself as a dreamer, is no stranger to Guyana, having won the Ministry of Public Telecommunication’s first Hackathon along with his team from Version75 Solutions (V75) in November, 2016. But long before he had risen to stardom, Marks had been quietly working behind the scenes, molding the nation’s youths to be the best version of themselves. For 12 years, he lectured and mentored hundreds of students at the Department of Computer Science at the University of Guyana. 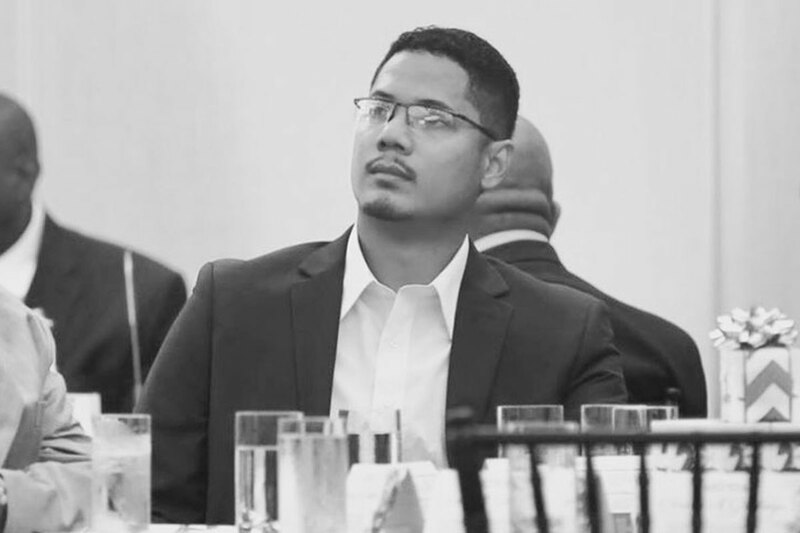 It was at that university that the former Bishops’ High School student had acquired his undergraduate Degree in Computer Science before pursuing a Master’s Degree in Computer Science at Howard University, Washington D.C. At Howard he specialized in Artificial Intelligence and completed the programme in three semesters with a 4.0 GPA. Although being exposed to what many describe as the “world of opportunities,” Marks opted to return home to contribute to the development of his country in the fields of Information and Communication Technologies (ICTs) and Entrepreneurship. Further, driven by his personal philosophy drawn from spiritual teachings and his innate desire to empower others while empowering himself, the husband and father of one made one of his many dreams a reality developing his own company – Version75 Solutions. Marks explained that V75 is a community disguised as a company uniting user interface design specialists, graphics designers, marketers, web developers, mobile application developers, database developers and software engineers to deliver the most effective, comprehensive and unified solutions. As a ‘dreamer,’ he told the budding entrepreneurs and software developers that there were risks that he had to take but it was important for his dream to materialize. “There are realists and then there are dreamers. A realist would understand certain parameters and these parameters would be based on what they can see, what they can touch, what they can feel,” he posited while explaining his perspective. A dreamer, on the other hand he explains, pushes beyond the limits set by society. “So being a dreamer really means constantly challenging those social norms, the status quo, pushing the limits and eventually discovering what more we can actually do and how much more we can deliver,” he explained. For him there is no harm in taking risks. “There is really no harm in taking that risk of setting an objective, however, crazy it might be. You set the objective as high as possible and whether you achieve it or not, you learn from it. Be as crazy as you possibly can be, ignore the status quo, set your goals and go after it with blind determination,” he posited. Though there will be challenges, there are meant to be overcome, Social Entrepreneur emphasized. Here in Guyana, Marks and his team at V75 were faced with the sad reality that acquiring local support from businesses in the field of ICT was a difficult one. But instead of ‘packing up shop’ and opting to do something else, they decided to target foreign markets. “Locally we are faced with this stigma with respect to our own local developers…. We have this diminished image of our own skills as Guyanese,” he explained. Its first client was a Canadian company. “Through networking, we were fortunate enough to secure an offshore client – a Canadian Insurance Company,” he added. Today, 64 per cent of its projects are for clients outside of Guyana. There was another challenge V75 had faced during its initial phase – the team had difficulties finding a common work space. It was out of that challenge that WeOwn Space was established approximately seven months ago. The collaborative work space, situated at Lot 3 David Rose Street and Aubrey Barker Road, South Ruimveldt Gardens, Georgetown, in the words of Marks, “gives local startups a fighting chance,” on a daily basis. It was further explained that WeOwn Space provides a unique environment for co-working, leaning, collaborating and networking to support Guyanese on their professional journey. Though Marks is the founder of V75 and the Co-founder of WeOwn Space, he said for both entities there is no boss, noting that the input of all team members is important and valued deeply. Outside of the world of ICT, Marks said he is a husband and father one. He said while pursuing one’s dreams is important, family is important too. Best Guyanese graduating student at the Hugh Wooding Law School, Latoya Roberts, received her Guyana Government Prize for 2016. The Guyana Government Prize is a mark of distinction awarded to the best graduating Guyanese law student. During the handing over ceremony yesterday , at the Ministry of Legal Affairs, Attorney General and Minister of Legal Affairs, Basil Williams, Senior Counsel (SC), applauded Roberts for her consistent excellence throughout her school years. Minister Williams highlighted government’s commitment to promoting and encouraging academic excellence among all Guyanese students. Attorney-at law Roberts, is currently employed in private practice. She said that she is still deciding what areas of law she would like to specialise in. Roberts said that having a law school in Guyana is the way to go because having gone through the system, she now understands the hardship that law students face while studying at the Hugh Wooding Law School in Trinidad. 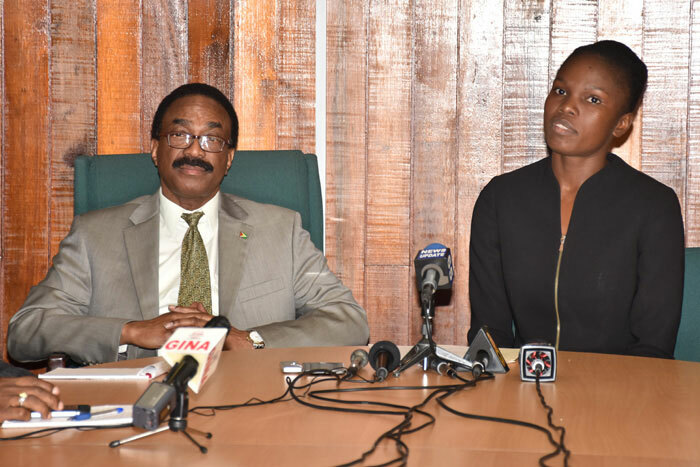 “There is also the talk of having too many lawyers, but I believe that Guyana is on the verge, once guided correctly, and in the right direction for so much development, we will need lawyers if we learn to specialise and diversify,” Roberts said. The attorney said that lawyers can contribute significantly to Guyana’s development hence, a local law school will be a plus for the country. Roberts attended the Sand Hills Nursery and Primary Schools in Vreed-en-Rust, West Bank Demerara, where she grew up. 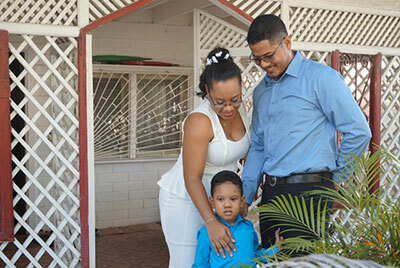 She also attended the North Georgetown Secondary School where she wrote the Caribbean Secondary Education Certificate (CSEC) graduating as valedictorian of her class, receiving passes in nine subjects. She then attended President’s College as a Sixth Form student and successfully graduated from that intuition as the valedictorian also.